Household Essentials double cubby is a side-by-side cubby that is exactly 2x the width of the single cubby. Household Essentials cubby storage system provides interchangeable cubby shelves and cubby storage bins for customizable cubby storage that fits your home. This double cubby is 11.22 inches high, 29.3 inches wide, and 11.81 inches deep and fits all Household Essentials open storage bins! 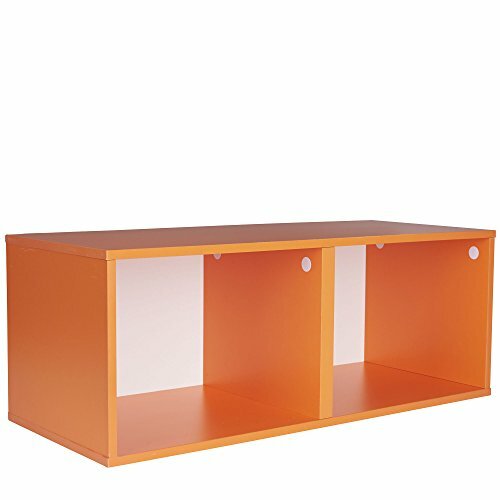 this double cubby has a smooth, laminate finish in vibrant orange! this great color is surprisingly versatile: a great accent for nearly any shade of blue and green and dark shades of brown, like Chocolate and mocha. Household Essentials storage cubbies come with a back panel, too, which can be installed for a Closed cubby or left off for an open cubby. The double cubby in orange, paired with paired with 2 Household Essentials open storage bins, is an ideal closet organizer or under bed organizer. Cubbies also work great on shelves. Get creative and Discover the new way to organize your world: Household Essentials cubby storage. All storage cubbies and storage bins are sold separately for a look that is tailor-made to you.